The practice of zen meditation is called zazan, it is very easy to describe and easy to follow, but it takes practice in order for it to happen. Body, mind and breath must come together as one when practicing zazen. There are several different leg positions one can choose from. We will only describe the half lotus and the kneeling position. The first position the half lotus. Sit on the floor place your left foot on your right thigh and the right foot is tucked under your left thigh. Place your left hand inside of your right hand letting the two tips of your thumbs touch lightly. Place your two hands on your lap, three to five centimeters below your navel, were your tan tien is located. Your back is held straight to allow the diaphragms to move freely. The breathing you will do in zazan becomes very deep. Your abdomen will rise and fall much the same way an infants belly rises and falls. Allow the diaphragm to move freely so that the breathing can be deep easy and natural. Do not try to control the breathing and do not force it to happen, it will happen by itself if you assume the right posture and position you body properly. The mouth is kept closed; the tongue is pressed lightly against the upper pallet. If saliva forms simply swallow. The chin is slightly lowered in lined with your spin, the eyes are kept lowered which your gaze resting about two or three feet in front of you. Your eyelids will mostly cover your eyes. The focus point will be on the breath itself. Mind and breath are one reality. When your mind is agitated your breath is agitated, when you are nervous your breath becomes quick and shallow. When your mind is at rest your breath is deep, easy and effortless. It is important to center your attention to the tan tien. We begin working on ourselves by counting the breath, counting each inhalation and each exhalation. Beginning with one and counting to ten, when you get to ten come back to one and start all over. If your mind begins to wonder and you become aware that you are chasing your thoughts, look at the thought, acknowledge it and deliberately and consciously let it go and begin to count again at one. When you are able to stay with the counting and repeatedly get to ten without any effort and any thoughts interfering it is time to begin counting every cycle of breath. Inhalation and exhalation will count as one, the next inhalation and exhalation is countered as two. Eventually you want just to fallow the breath and abandon the counting altogether. Let the breath breathe itself, this is the beginning of the falling away from body and mind. Out of stillness our whole life arises. 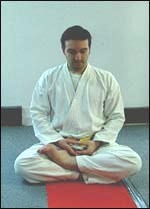 When going into the kneeling position, kneel down on the floor with your buttocks resting on the upturned feet which form, an anatomical cushion. From which therefore The Zen meditation above mentioned can also be applied.